Paper fleece 130 is an economical solution for the repair of old plaster substrates and for the coating of dry walls (e.g. plasterboard, gypsum fibre boards, OSB). 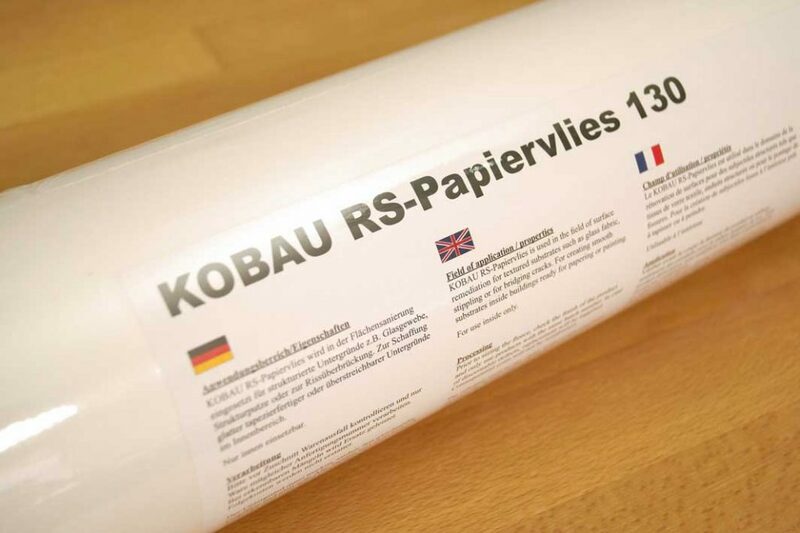 Kobau RS-Papiervlies 130 is an economical solution for the repair of old plaster substrates and for the coating of dry walls (e.g. plasterboard, gypsum fibre boards, OSB). evenly absorbent surface, thus very simple to coat. can be coated with thin-layer putties (lime smoothing, lime adhesive plasters, marble fibre plaster, fine plaster, marmorino)>>> water-resistant dispersion adhesive required. Dry peelable after pre-treatment with wallpaper changing primer and use of a powder fleece glue. For wallpapering machine, brush application and wall bonding technology. Safety on problematic new plaster surfaces, old plaster and plasterboard. For all kinds of woodchip wallpapers, renovation and reinforcing fabrics, structured non-woven wallpapers, embossed and special wallpapers, vinyl and textile wallpapers as well as glassfibre. The substrate must be dry, load-bearing and free from separating agents (formwork oil, grease, dust, etc.). Remove old wallpaper, poorly adhering paints and loose plaster. Repair cracks, holes and unevenness with pufamur Super Adhesive Filler SH 45 or PUFAS Filler Filler Filler inside. Solidify sandy and chalking substrates with PUFAS Tiefengrund LF. Pre-paste or prime highly absorbent substrates. 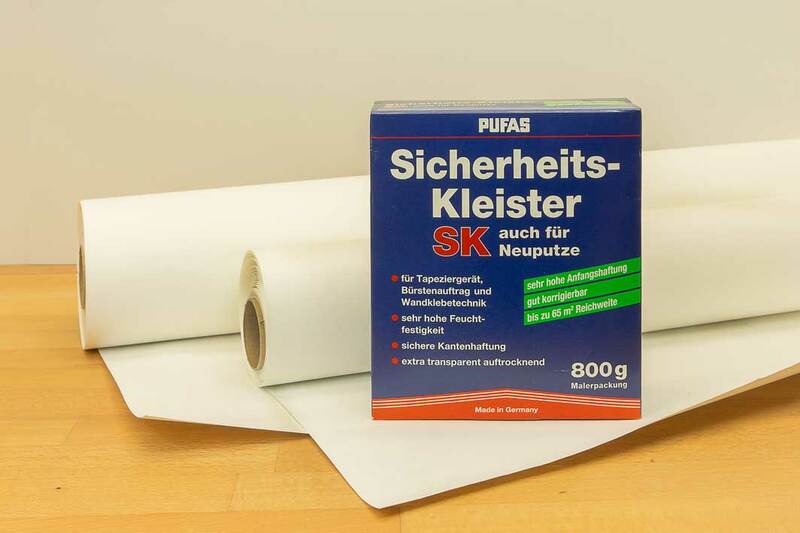 Stir PUFAS Safety Adhesive SK quickly and vigorously into cold, clean water (see table) and continue stirring for a short time. Stir again after 2 – 3 minutes. After 15 minutes stir again vigorously. Apply the paste evenly to the back of the wallpaper using a wallpapering machine or a brush in the required thickness. Then glue the wallpapers according to the manufacturer’s instructions. Dimensionally stable wall coverings that do not require soaking time can also be applied using the wall bonding technique. Apply the paste to the substrate with a spray gun or a short pile roller in the width of a roll. Place the wall covering in the wet paste and press down evenly with a roller (foam rubber roller) or a wallpapering wiper. Wash off paste residues with clear water and rub with a clean, dry cloth. Clean tools with water immediately after use. Do not use below +5 °C object and room temperature. Only empty containers should be recycled. Dried-in material residues can be disposed of via household waste or as construction waste. Waste code no. EWC 08 04 14. Store in a cool and dry place. Keep container tightly closed.